Time to tease your hair and style it with mega puffs of hairspray. Put on layers upon layers of black eyeliner. Wear shoulder pads, and put on your acid wash jeans…Those flashy 80s OOTDs are as exhilirating as the concert that can bring together multi-generations of fans. Yes, we're talking about Gen-Xers down to the Gen Z – Stranger Things fans who are hooked on electrifying sound of the 80s. 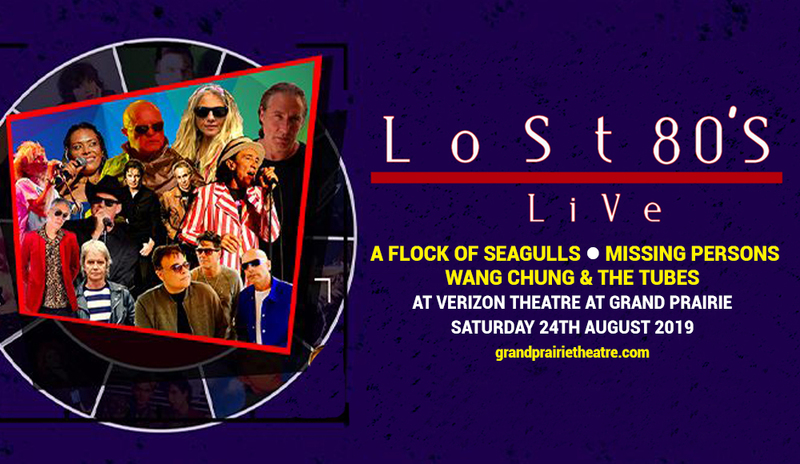 "Lost 80's Live" — a concert collective of all-80s artists, will bring nothing but all-hits to the Verizon Theatre at Grand Prairie stage on Saturday 24th August 2019. A Flock Of Seagulls, Wang Chung, The Tubes, Missing Persons, Farrington+Mann the original members of When In Rome UK, The Vapors, Real Life, The Escape Club, John Parr — hell yeah! It's just like turning on the radio back then, and singing and dancing along to hit-after-hit-after hit! If you don't hit that 'buy tickets' button now, you're definitely going to miss the showboat that will take you this hair-rising (no pun intended) musical journey. Book your tickets now! Since 2007, "Lost 80's Live" has been on a mission to search for the one-two-or even-three-hit-wonders and put them all together in one live show, and play nothing but the hits. Both artists and fans are in a win-win scenario. The 'has-been' stigma for the artist dissipates as fans shower them with a roaring and rousing welcome onstage and sing, dance, and simply have a great time with the music. This year, they're on to it again. "Lost 80's Live" has stacked-up a delectable smorgasbord of acts running the gamut of A Flock Of Seagulls, Wang Chung, The Tubes, Missing Persons, Farrington+Mann the original members of When In Rome UK, The Vapors, Real Life, The Escape Club, John Parr. How can you resist missing a show that calls on the audience to "Everybody Have Fun Tonight"; or drives you to sing-along to the anthemic "The More You Live, The More You Love"; or get you into thinking if you're "Turning Japanese"? When it comes to live 80s nostalgia, this is the super playlist, bar none. Go and get those tickets now!